In the crowded market of sports sedans, Giulia has an ace up its sleeve. The allure begins with the distinctive Alfa Romeo “Trilobe” shield grille and is enhanced through elegant lines, a proportional design and harmonious elements. For over 105 years, Alfa Romeo has inspired greatness on and off the track. True to its racing heritage, the Alfa Romeo history is based on excellence and legendary victories. From avant-garde technology and record-breaking performances to stylistic elegance and fine Italian craftsmanship, Alfa Romeo’s résumé leaves nothing to desire. Now, Alfa Romeo is returning to its roots with a world-class sports sedan designed to perform. Underneath the studied mix of leading-edge technology and expert engineering, every detail of the Alfa Romeo Giulia is intended to stir emotions. It’s a unique approach to designing automobiles that has been part of Alfa Romeo’s innovative heritage for more than a century. 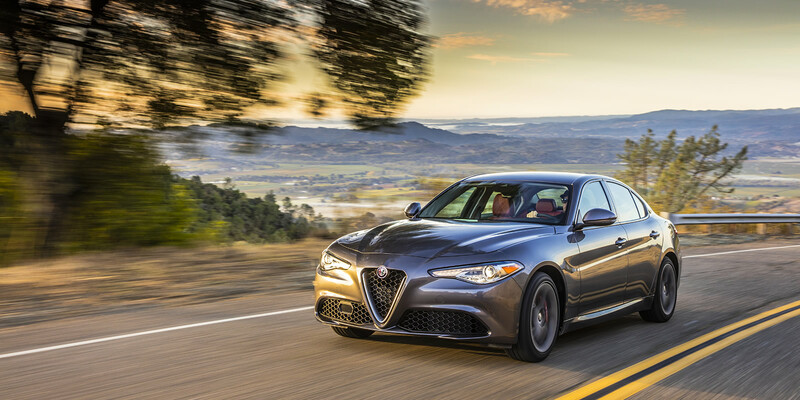 The Giulia is no exception. Featuring high-strength composite materials and advanced engine technology, this powerful sports sedan is ready for whatever life throws its way. A class-exclusive3 feature of the all-new Giulia is its carbon fiber drive shaft, which significantly reduces the vehicle weight without sacrificing performance, helping the Giulia optimize its near perfect weight distribution. Thanks to its high-definition lighting system, the Giulia is designed to help ensure that every road, turn and obstacle is clearly visible. Illuminating the way is a pair of standard Bi-Xenon Headlamps with signature LED Daytime Running Lights, which are complemented by LED tail lamps that exude its highly competitive nature with a furrowed expression and laser-sharp focus. The Giulia delivers confidence-backed performance thanks to its advanced rear-wheel drive technology. Offering more grip during acceleration and on corners, Alfa Romeo’s rear-wheel drive optimizes the overall force for better handling at high speeds. For even greater control, the innovative Q4 AWD system provides the same commanding approach with all season traction and optimizes performance by transferring up to 60 percent of its engine’s torque to the front axle. Linked to the Chassis Domain Control and the driver-adjustable Alfa DNA Drive Mode Selector, the system continuously monitors road conditions to ensure ideal torque distribution in any situation. After all, better traction lets you explore life’s every curve without worrying about road and weather conditions. With a no compromise approach to engineering, Alfa Romeo introduces a vehicle with lightness, structural stiffness, efficiency and performance. The Alfa Romeo architecture combines a longitudinal engine design with rear or all-wheel drive, and a weight distribution that is carefully managed to obtain optimized distribution across the front and rear axles. Thanks to its dynamic Alfa Active Suspension system, which adjusts the suspension response depending on the driving mode and road conditions, road grip and performance are optimized even in the most challenging conditions If unwavering agility and handing are rooted in balance, the Giulia has them in spades. The construction of the Alfa Romeo Giulia is expertly and artfully assembled at a newly renovated, world-class sustainable plant located in Cassino, Italy. This high-tech environment uses World Class Manufacturing processes with a special emphasis on innovation, precision, energy efficiencies, teamwork and engagement. This level of excellence extends to cutting-edge techniques such as dry-scrubbing, a paint shop process that uses zero water and zero added chemicals. Individual work stations are created with the highest ergonomic standards and the assembly line is built around people, creating an operation that is as finely tuned as an orchestra. You can be sure that each and every Giulia is crafted with artisan care. With an unmistakable elegance, the aerodynamic lines and race inspired stance of the Giulia are a mix of pure power and ingenuity. Yet beneath all this beauty lie carefully selected materials that ensure its optimal weight distribution. It’s a calculated harmony of engineering that fuels responsiveness and stirs emotions, within a groundbreaking sports sedan that only Alfa Romeo could have designed. As a defining touch to its distinctly Italian design, the celebrated central shield and air-intakes are sculpted within the front fascia to form the signature Trilobo, an Alfa Romeo design staple. Finally, top down personalization elements are yet another way drivers can take their Alfa Romeo experience to a higher level. Sometimes, breaking with convention requires the passion to dream and the skill to obtain it. It means exploring new frontiers in search of excellence. It results in the birth of a masterpiece. Enter the Giulia; the first Alfa Romeo in which power and lightness coexist as two faces of the same coin. With near-perfect balance and a calculated combination of ultralight materials, including carbon fiber, aluminum and high-strength composite materials, this Italian sports sedan ups the ante on class-leading performance. The Giulia is the result of asking the world’s most talented automotive designers to create a sports car that fully responds to every driver’s needs. Armed with the freedom to impress likeminded enthusiasts, they started by compiling a comprehensive “wish list” of features. A true original, every aspect of the Alfa Romeo Giulia has been designed to put the driver in his element and driving pleasure to the test. Alfa Romeo’s commitment to vehicle safety extends to the Giulia’s advanced safety and security features designed to help keep the driver and passengers out of harm’s way.